I had the fortune of winning a PSP in a contest a few weeks ago, and in my hunt for an inaugural game for the system, I spotted Jeanne D'Arc on a shelf in a local toy store. Because the cover sports an awesome girl with a sword and because no one does medieval European history like the Japanese, I picked it up. 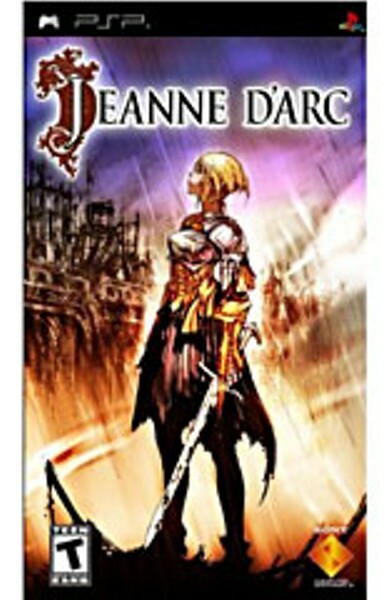 Jeanne D'Arc is historical fantasy with a plot that seems a little too familiar. The Level-5-developed title has a lot of the elements of your average Japanese role-playing game: a heroine whose home is put to the torch by agents of a diabolical figure (in this case Henry VI of England) under the influence of a demon summoned by the real villain, who is a sorcerer. Jeanne and her childhood friends set off to fight back, spurred by Jeanne's discovery of a magical, demon-vanquishing armlet. They are accompanied by a cute animal companion, required in all Japanese RPGs — in this case a giant purple toad. The rough placement of the story within the framework of a well-known legend is what rescues the plot from being completely pedestrian. The game, a tactical strategy RPG in the style of Final Fantasy Tactics with few deviations from the formula, has a map of locations through which the player travels. Most locations have battles, though some also have shops and plot-revealing cut scenes. On entering a battle, the player chooses various characters with different abilities and arranges them on a large grid. The player and the computer take turns moving all of their characters and making them attack or use an item in their inventory. Think of a chess game in which all of the pieces have big swords and bigger hair. Jeanne D'Arc adds a few little power-ups — such as squares where your attacks have a greater impact — but these don't affect game play much. One thing I really liked about the game is that each character has a backstory. You aren't controlling a bunch of nameless soldiers. Your characters are also fairly customizable. Usually each character in an RPG is locked into a career path for the benefit of the story, and usually the healer is a demure woman. This irks me. Jeanne D'Arc let me create a butch male healer who swoops to the rescue whenever one of my little chess pieces is hurting. Jeanne D'Arc is nothing new, but it's fun, and the development of the minor characters involves the player in a way that's refreshing for a tactical RPG. The quality of the graphics and sound are exceptional for a handheld game; I found myself humming the fight tune in the shower, so I guess the music's more memorable than most. That said, if the narrative keeps following history, it's going to be a bummer to see a character I've developed for 40 hours get burned at the stake at the end. Oh well.